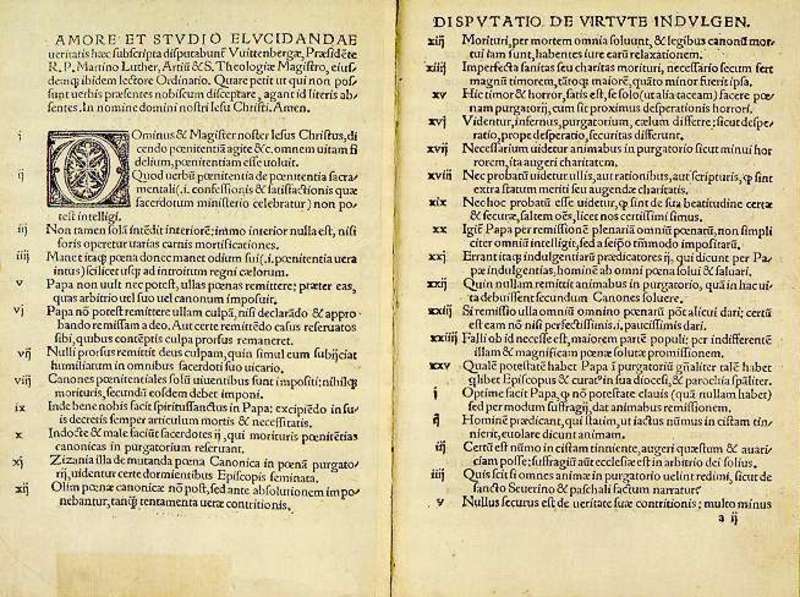 Originally written in Latin by Martin Luther in 1517, the Ninety-Five Theses, which Luther posted on the door of the Cathedral at Wittenburg, are regarded as a primary catalyst for the Protestant Reformation. Although most Americans readily recognized October 31st as Halloween, many people around the world acknowledge the last day in October as Reformation Day. Many Protestant Churches celebrate “Reformation Sunday” as the last Sunday in October, in light of October 31, 1517 being the actual date when Martin Luther nailed his “95 Theses” to the door of the Wittenberg Church in Germany, igniting the Protestant Reformation. From the Protestant Reformation emerged five phrases that summarized the movement. Using the word Sola the Latin word for “alone,” these basic theological beliefs stood boldly in opposition to the prevailing teaching of the Roman Catholic Church at the time. Sola scriptura (“by Scripture alone”) teaches that the Bible is the only inspired and authoritative Word of God, the only source for Christian doctrine, and is accessible to all and that the Bible requires no interpretation outside of itself. Sola fide (“by faith alone”) teaches that justification, the act of “being declared right by God”, and assumed to mean exactly “salvation”), is received by faith only, without any mixture of or need for good works, though in classical Protestant theology, saving faith is always evidenced by good works. Sola gratia (“by grace alone”) teaches that salvation comes by God‘s grace or “unmerited favor” only. This means that salvation is an unearned gift from God through faith in Jesus Christ. Solus Christus or Solo Christo (“Christ alone” or “through Christ alone”) Teaches that Christ is the only mediator between God and man, and that there is salvation through no other. Soli Deo gloria (“glory to God alone”) Teaches that all glory is to be due to God alone, since salvation is accomplished solely through His will and action — not only the gift of the all-sufficient atonement of Jesus on the cross but also the gift of faith in that atonement, created in the heart of the believer by the Holy Spirit. With Scripture alone as the sure foundation, the Reformers affirmed that justification is by grace alone, received through faith alone because of Christ alone — for the glory of God alone. Today Christians around the world give thanks to God for Martin Luther’s bold proclamation and the unfolding of God’s design for the Church which occurred 497 years ago and continues to be revealed. Out of the Reformation, came forth a “new sound”, commonly refer to as “the hymn.” Here is a performance of “A Mighty Fortress Is Our God” which has become known as “The Battle Hymn of the Reformation.” Luther composed the song after reading Psalm 46 which became the text for this most popular and best known hymn. Halloween and some of its negative aspects, such as pranks, remind me of an incident a friend shared with me when he went to live with a relative in the rural South where there was no indoor plumbing, and everyone used an outdoor toilet known as an “outhouse.” Unbeknownst to my young friend, the custom on Halloween night was to move the “outhouse” from its original position so that when a person stepped inside, he would fall into the pit. That’s exactly what happened, and my friend immediately cried out, “Daddy, Daddy, come and get me!” His father came running with a flashlight and reached down and grabbed his son by the collar and snatched him out of the horrible pit. Fixed me up in my Father’s house. Why Don’t Somebody Help Me Praise the Lord? He [the God of Daniel] delivers and rescues, and he works signs and wonders in heaven and in earth, who has delivered Daniel from the power of the lions. Didn’t my Lord deliver Daniel, deliver Daniel, Deliver Daniel? Didn’t my Lord deliver Daniel? Then why not every man? Indeed, I knew you before you were first conceived. Rest in me: I will perform all I said to do. Know that I will sustain you and will rescue you. 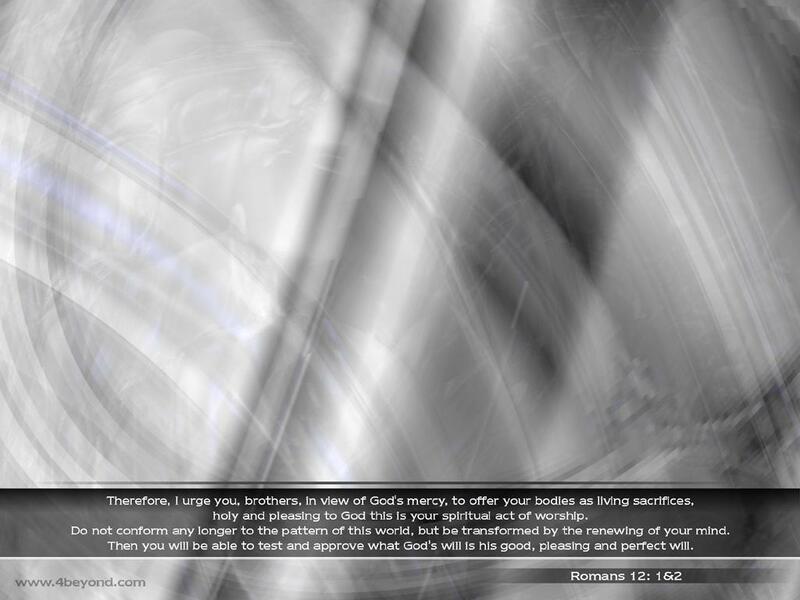 The Verse of the Day for October 29, 2014 is found in Romans 12: 1. Verses 1 and 2 became the focal point of a blog entry posted two weeks ago, which is revised and re-posted below. The topic of the passage relates to “renewing the mind: an ongoing process.” Two weeks later, we are still in the process of renewing our minds, and so it will be until Christ returns when we shall experience the ultimate transformation. 1I appeal to you therefore, brethren, and beg of you in view of [all] the mercies of God, to make a decisive dedication of your bodies [presenting all your members and faculties] as a living sacrifice, holy (devoted, consecrated) and well pleasing to God, which is your reasonable (rational, intelligent) service and spiritual worship. 2 Do not be conformed to this world (this age), [fashioned after and adapted to its external, superficial customs], but be transformed (changed) by the [entire] renewal of your mind [by its new ideals and its new attitude], so that you may prove [for yourselves] what is the good and acceptable and perfect will of God, even the thing which is good and acceptable and perfect [in His sight for you]. This passage brings to mind the process of metamorphosis that butterflies and other organisms undergo, reminding us of a similar spiritual process called “renewing the mind.” Christians are instructed not to be conformed but to be transformed by the renewing of their minds (Romans 12:1). The New Testament phrase is translated from the Greek word metamorphoo, from which the English word metamorphosis is derived. The phrase is also used to express that as believers strive to manifest more of Christ in their lives, they are also “changed” into the same image. but if it dies, it produces much grain. What is death to the caterpillar we call a butterfly. From the dark of earth new life stems from seeds once sown. Totally transformed into glorious liberty. As we write another chapter of our life’s story. Transformed from egg to larva to pupa to adult. 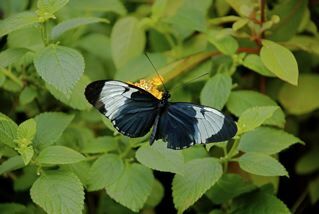 The accompanying video shows a butterfly emerging from a chrysalis. The Verse of the Day reminds us that as we renew our minds, we prove what is the good and acceptable and perfect will of God. Listen to the Romans 12-1-2 Song “A Living Sacrifice” (Christian Scripture Praise Worship Song with Lyrics). 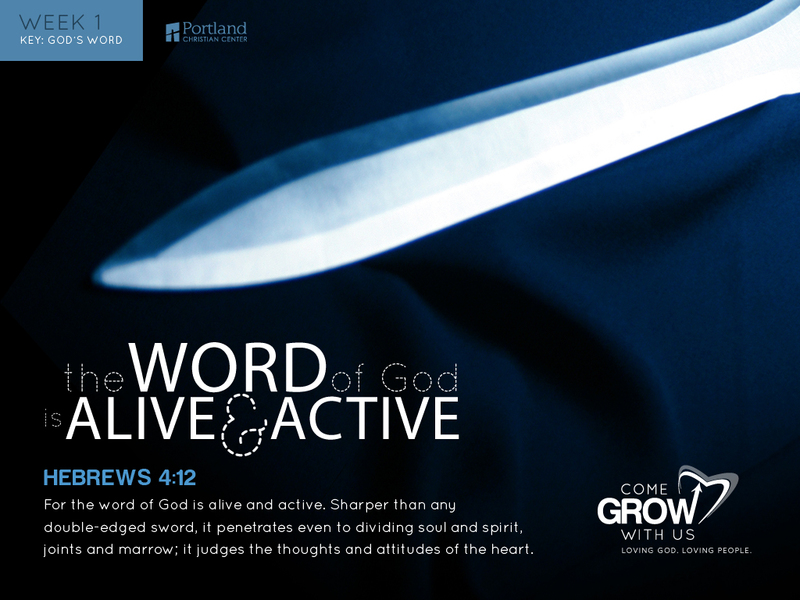 For the Word that God speaks is alive and full of power [making it active, operative, energizing, and effective]; it is sharper than any two-edged sword, penetrating to the dividing line of the breath of life (soul) and [the immortal] spirit, and of joints and marrow [of the deepest parts of our nature], exposing and sifting and analyzing and judging the very thoughts and purposes of the heart. That in the beginning God spoke and it was so. The past, present and future, as it brings forth life. While yet in our mouths, it has surely come to pass. 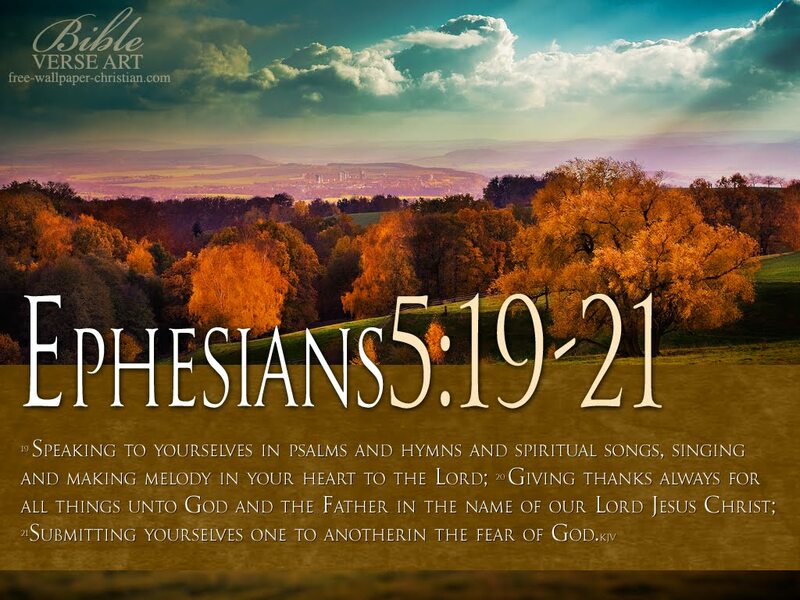 At all times and for everything giving thanks in the name of our Lord Jesus Christ to God the Father. 16 Let the word [spoken by] Christ (the Messiah) have its home [in your hearts and minds] and dwell in you in [all its] richness, as you teach and admonish and train one another in all insight and intelligence and wisdom [in spiritual things, and as you sing] psalms and hymns and spiritual songs, making melody to God with [His] grace in your hearts. 17 And whatever you do [no matter what it is] in word or deed, do everything in the name of the Lord Jesus and in [dependence upon] His Person, giving praise to God the Father through Him. The Word of God reveals further reveals that the giving of thanks is to be more than an occasional act of gratitude; it is to be an ongoing part of our lives. 6 Do not fret or have any anxiety about anything, but in every circumstance and in everything, by prayer and petition ([a]definite requests), with thanksgiving, continue to make your wants known to God. 7 And God’s peace [shall be yours, that [b]tranquil state of a soul assured of its salvation through Christ, and so fearing nothing from God and being content with its earthly lot of whatever sort that is, that peace] which transcends all understanding shall [c]garrison and mount guard over your hearts and minds in Christ Jesus. 15 Through Him, therefore, let us constantly and at all times offer up to God a sacrifice of praise, which is the fruit of lips that thankfully acknowledge and confess and glorify His name. 18 Thank [God] in everything [no matter what the circumstances may be, be thankful and give thanks], for this is the will of God for you [who are] in Christ Jesus [the Revealer and Mediator of that will]. In Christ Jesus concerning you. He works all things together for our good. We still give thanks always for all things. We keep an attitude of gratitude. The reverent and worshipful fear of the Lord is the beginning (the chief and choice part) of Wisdom, and the knowledge of the Holy One is insight and understanding. The [reverent] fear of the Lord is clean, enduring forever; the ordinances of the Lord are true and righteous altogether. Thoroughly washed in the fountain of holiness. Redeemed and justified by Christ, my righteousness. As You search the earth, may I find grace in your sight. I seek to be wise but never in my own eyes. A beloved son, whose heart Your Word purifies. The fear of the Lord is clean, enduring forever. As I pursue wisdom, growing in the fear of the Lord. “We Choose the Fear of the Lord” by the Maranatha Music also relates to the beginning of wisdom. 25 And in the fourth watch [between 3:00—6:00 a.m.] of the night, Jesus came to them, walking on the sea. 26 And when the disciples saw Him walking on the sea, they were terrified and said, It is a ghost! And they screamed out with fright. 27 But instantly He spoke to them, saying, Take courage! I Am! Stop being afraid! 28 And Peter answered Him, Lord, if it is You, command me to come to You on the water. 29 He said, Come! So Peter got out of the boat and walked on the water, and he came toward Jesus. 30 But when he perceived and felt the strong wind, he was frightened, and as he began to sink, he cried out, Lord, save me [from death]! 31 Instantly Jesus reached out His hand and caught and held him, saying to him, O you of little faith, why did you doubt? 33 And those in the boat knelt and worshiped Him, saying, Truly You are the Son of God! A tempest attacks my ship with waves that overwhelm. Jesus comes walking on the troubled waters of life. As storms of our times bring conflict, confusion and strife. And step out of the boat to walk on the storm-tossed sea. And walk hand in hand with the Master back to the ship. 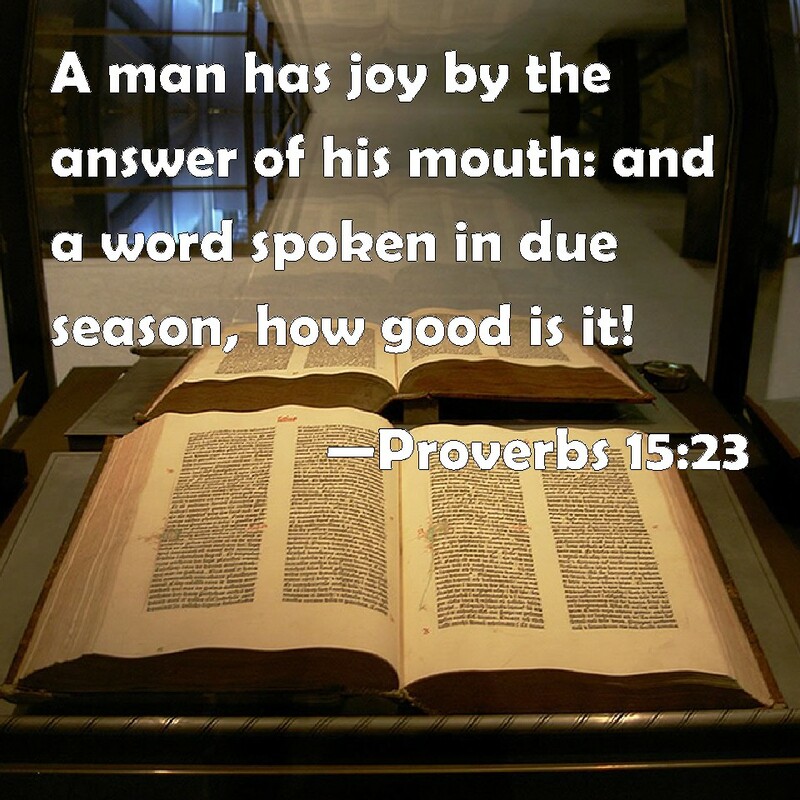 A man has joy in making an apt answer, and a word spoken at the right moment—how good it is! A word fitly spoken and in due season is like apples of gold in settings of silver. “Verse 11 ‘Apples of gold’ had nothing to do with apples. These are a kind of orange we grow in Egypt, Syria and India of which there is no English name. . . There is a special orange tree called Kitchilika tree, sweetest of all oranges. This fruit makes a refreshing drink which soothes and comforts. It is gold in color, and does not last long after it is ripe and can’t be exported outside of the country. Very tasty, we make sherbet of it, and it is easily smelled when ripe on the tree. They are very beautiful to look at and quench the thirst quicker than any other juice. It was called apples of gold because there was no other English word. A great way to start the day is with a glass of “OJ”—orange juice of a special kind. 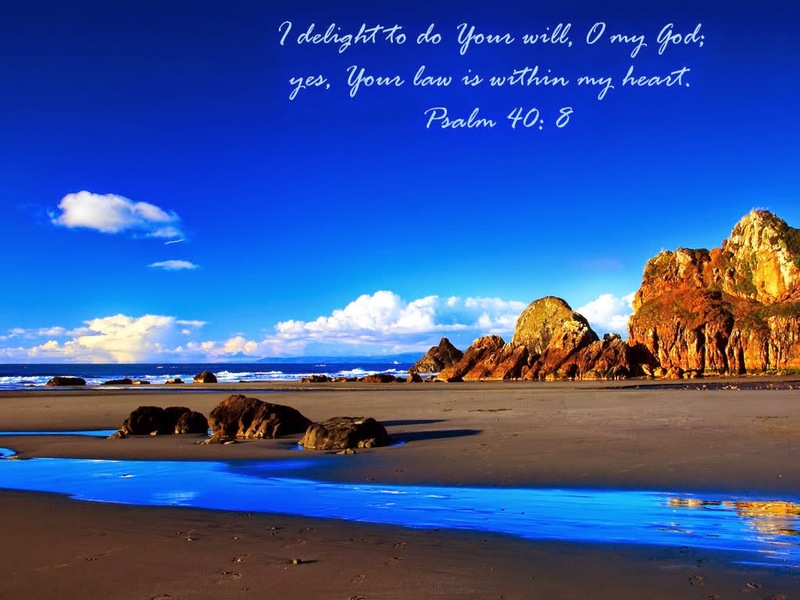 I delight to do Your will, O my God; yes, Your law is within my heart. To find the will of God is the greatest discovery. To know the will of God is the greatest knowledge. To do the will of God is the greatest achievement. I rejoice to find, to know and do the will of God. 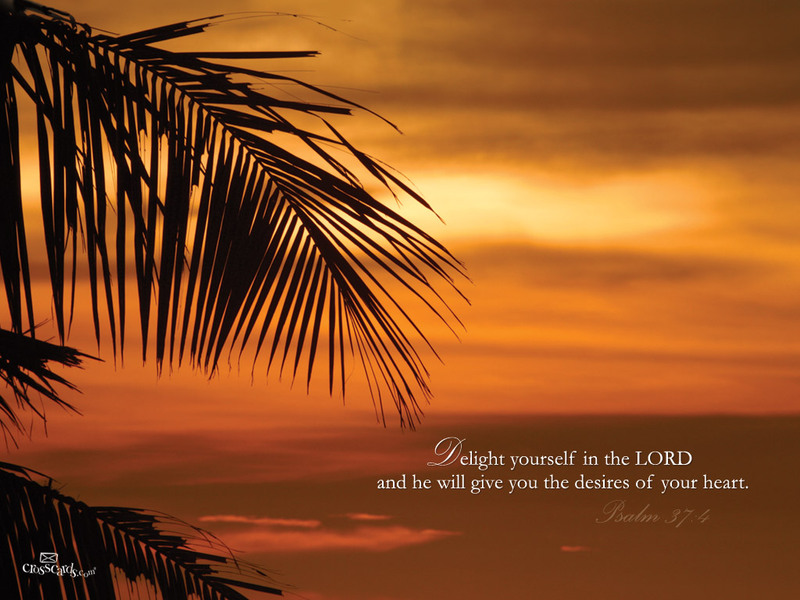 4 Delight yourself also in the Lord, and He will give you the desires and secret petitions of your heart. 5 Commit your way to the Lord [roll and repose each care of your load on Him]; trust (lean on, rely on, and be confident) also in Him and He will bring it to pass. That’s Romans 8:28, my all-time favorite verse in the entire Bible. 1 Praise the Lord! (Hallelujah!) Blessed (happy, fortunate, to be envied) is the man who fears (reveres and worships) the Lord, who delights greatly in His commandments. That bears fruit each season, wherever it may fall. The passion of my heart. May I know the touch that will quicken and enthrall. Touched by God’s hand, my life now reveals such deep need. 10 And after you have suffered a little while, the God of all grace [Who imparts all blessing and favor], Who has called you to His [own] eternal glory in Christ Jesus, will Himself complete and make you what you ought to be, establish and ground you securely, and strengthen, and settle you.